A Musical Mystery: Is Someone Dropping A Surprise Album? It could be a diva with a flashy new release. Should the mystery item be something like Adele‘s 25, it could save a 15% drop in albums year-to-date. It may even be capable of selling 1 million copies in its first week as the followup to the Diamond certified 21. There’s also singer Taylor Swift, who is due for a new album at some point this year. Both the country and pop communities would be excited by new music from her. We also have Rihanna, who last year was reported to be involved with two albums seeing a 2014 release date rather than completing a new set for a 2013 date. Finally, there’s Lady Gaga; we’ve heard whispers of an ARTPOP 2 coming at some point, and we’re also likely to see her collaboration effort with Tony Bennett, Cheek To Cheek, this year. Question is, will it be now? It could be a solo rapper. Given the recent $3 billion deal between Apple and Beats By Dre, could we be upon the release of that decade-plus-in-the-making Detox by Dr. Dre? It certainly makes sense given all the news lately, but then again, it’s been pushed back so many times that it may never see the light of day. Lil Wayne‘s Tha Carter V is also in the running given that a leadoff single is now on the charts; so is his cohort Nicki Minaj with The Pink Print. Both are anticipated after an underperforming Young Money compilation. We also can’t forget about rapper Wiz Khalifa‘s Blacc Hollywood; with no date yet, it could fit in here. Kanye West may be an option as well. It could be act that’s had decades of success and is looking to making some sort of comeback. 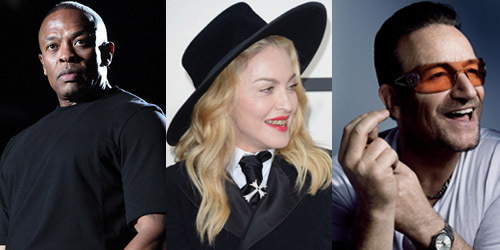 Madonna‘s name has been thrown around quite a bit since the announcement of a surprise release; she and Katy Perry have been working together recently, and she’s been in the studio with both Avicii and Natalia Kills. Prince recently signed a new deal with his old label Warner Bros. – could this be the first of his new albums for them? There’s also U2, who have released a few tunes since the beginning of the year: “Invisible” and “Ordinary Love” (from the film Mandela: Long Walk to Freedom.) Was their album really pushed back to 2015… or is now the right time to put it out? We also have the performers that could be the ultimate shock. Could you imagine if Gwen Stefani dropped an album out of nowhere? After all, she will be judging on The Voice this season and has been working on some sounds with the other new judge on the panel, Pharrell. Given all their playing at festivals in the last few months, wouldn’t it make sense for Outkast to release an album? Epic has a little momentum (can’t give them too much credit) with the Michael Jackson posthumous effort. What about Justin Bieber in his attempt to silence the critics? What about JoJo and her first album in eight years? Far too many options, so little time to analyze them all. The curiosity factor is going to go on for some time and I’m not sure I’ve helped things totally, but we’ll see what happens this week! Think it may be someone else? Frank Ocean? Janet Jackson? Kesha? Let me know! Comment below or find me on social media by clicking the “Get Social!” tab above.